Loved this book. The back story really provides a lot of historical information as well as mystery into how all of the characters developed. I also can't help but root for Michael and Jessica. Can't wait for book 3. The Troubles is my first foray into Connie Johnson Hambley’s tense world of identity, terrorism, and horses. No spoilers here, other than to say that it takes a deft hand to convey foreign culture and Anglo-Irish politics. Jessica Wyeth is a strong female character without the author having to resort to making her distant and difficult. The pacing is tense, the descriptions lyrical, and the action, realistic. Midway through the story, Jessica participates in a vivid race in which another jockey does something unsportsmanlike, but the real surprise is her discovery when she undresses after the steeplechase. Great writing. The author is an equestrian and her knowledge of horses is as accurate as it is harrowing. I’ve ridden polo ponies (read: fearless and fast thoroughbred-quarter horses), and I’ve experienced speed, chaos, and the terror of nearly losing control of the horse. Hambley captured that in hooves and heartbeats. The greater story arc, however, is a mystery about love, personal history and what to do with knowledge. The Troubles is also an intelligent and moral story about secrets, about illusions and the violence they create. Highly recommend. “A female protagonist to be reckoned with”Ireland is one of a handful of countries in the world where certain elements are inextricably linked. Religion and politics; dark, forbidding towns and cities scattered around a desolate sprawling countryside that is both beautiful and mystical. Oh, and there are horses too.I haven't read 'The Charity' the first book in this trilogy, but the author cleverly jogs the memory of the returning reader and leaves enough clues for newcomers to understand what went before. Jessica Wyeth is an incredibly strong character, who needs to uncover her roots, no matter what it takes. The story, and the back story are superbly crafted together and I had no problem switching between past and present as the whole picture was gradually revealed. Religion and politics are to the forefront of the plot. 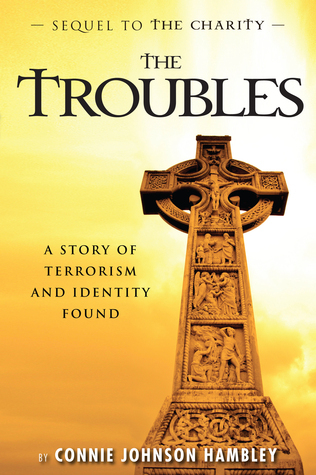 The 'troubles' that scarred the dark towns and cities play a role too. As for the magical countryside, the local folk and the horses - well it wouldn't be Ireland without them, would it?I am neither a religious nor political man, but I found this story to be extremely well written and captivating. Hambley's novel is exciting and intriguing. She deftly weaves together stories across the decades into a final conclusion that satisfies and surprises. Her recreation of "the Troubles" in Ireland and across the the Atlantic to the U.S., even across generations, beautifully recreates the history and feeling of these violent times by giving us thinking and feeling characters who ring true. The descriptions of place in Ireland make you want to book a ticket! She knows her setting! And being an "improver of the breed," I especially enjoyed her descriptions of racing and training horses. This is a thrilling read, with a strong female character I liked and rooted for. If you’re like me and love well-done mysteries and thrillers with a historical bent, you’ll love Connie Johnson Hambley’s "The Troubles." The second volume in Hambley’s “Jessica Trilogy,” but readable as a stand-alone, "The Troubles" combines a contemporary (romantic!) suspense plot featuring Jessica Wyeth, a compelling, complex heroine with identity issues, with flashbacks to the morally ambiguous entanglements and agendas of the Irish freedom fighters of the 1960s and 1970s who are, quite literally, in Jessica's blood. Hooked on The Charity, I of course, had to read The Troubles. The story continues in a volatile Ireland centered around a woman's quest for her roots. Politics, religion, secrets, and personal conviction are all undercurrents here. The feeling is rich, but the writing is sparse -- cuts to the bone. No excess. No fluff. Strong story with surprising twists. This is the second is a series of three books. I enjoyed it a lot! It delves into Irish politics and history and how they connect to the heroine. The characters are real, warts and all. There are many times you can't stop turning the pages to see what happens next. I also really enjoyed that many different characters' voices are heard. Connie Johnson Hambley - Connie Johnson Hambley grew up on a small dairy farm just north of New York City. In 1965, an arsonist burned her family's barn to the ground. From that experience grew the stories that have become "The Charity" and "The Troubles. "Hambley writes about strong women from their perspective in situations that demand the most from them. No special powers, no gadgets, no super human abilities. Just a woman caught up or embroiled in something that she has to get out of, hopefully alive.Every bit of personal experience is used to create a story that is as believable as it is suspenseful. Using her law and investment background in ways unique, creative, but not altogether logical, Hambley has enjoyed robust professional pursuits that include writing for Bloomberg BusinessWeek and Nature Biotechnology. Experience at a major bank in Boston introduced her to clever schemes dreamed up to launder money.Hambley writes page-turners and "The Charity" is the first in a series. Look for updates and information on facebook/thecharitythriller, on Twitter follow @conniehambley and thecharitythriller.